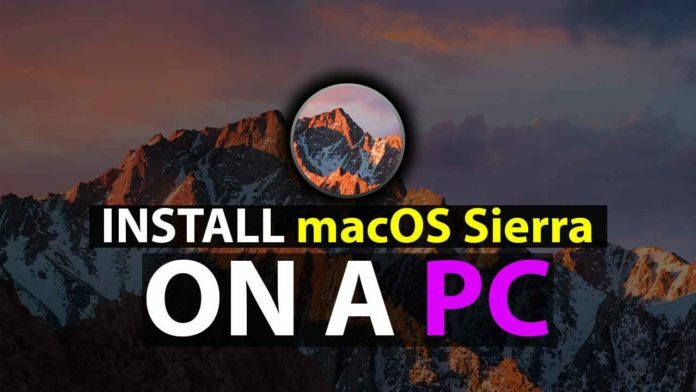 How to Install OS X macOS Sierra On PC | With Windows, Without Mac There is no use of MAC Computer, you will need only Windows PC. and One USB flash Drive. It’s very simple and easy. In Windows Create a Virtual Machine of macOS Like El Capitan or macOS Sierra. Then In this Download and Create macOS from Apple App Store. I have created macOS Sierra installer from Unibeast software.Then I installed Mac OS and Then Installed Windows and after then Installed Bootloader. So Hey Guys, My name is kashif and in this Post, I’m Going to Show you How you can Install Mac OS Sierra On Your Windows-based PC. Without using any MacBook or anything, in this tutorial, we will only use Windows PC. So Guys As you know Installing MacOS is not an easy Task. before Installing just check whether your Computer or Laptop is Compatible or not. Most of the Gigabyte motherboard are Supported, because of Ethernet, sound and Some other drivers. and You Just need at least 8gb of Pendrive to create Installation Media. As We don’t have any MacBook or installed MacOS installed. Click on Erase and your USB is ready to create mac os installation media. Now open uni beast and Click next and agree to the terms and conditions. If your motherboard is based on UEFI just select UEFI or else select legacy. My Motherboard support both UEFI and Legacy. I will choose UEFI because My Windows is Installed on UEFI Mode. if you are using USB 3.0 it will 10-15 min. and If you have created in legacy mode select only Pendrive name option. Now You will see Apple Logo. Click on Erase and Name it anything. The scheme as GUID partition. Close disk utility and click on continue. click on the disk and install. it will take about 12 minutes if you are using SSD. Now this time we have to boot from Our Disk in which we have installed MacOS Sierra. Select the disk and hit enter. Now copy all the files from other USB which you have downloaded. I will choose UEFI because I have installed MacOS on UEFI Mode. and select Inject Nvidia if you have any Nvidia Graphics card. Now drag the Voodoo Kext into kext utility. Now Open the Nvidia Graphics Driver and Install it. Now open the EFI folder and go into clover and Edit it with Text Editor. Now Scroll Down and Open paste this Code into this Line. Save it and Close all the things. Eject the Pen drive Also. Congratulations We have Installed macOS Sierra successfully. As you can see all the things are installed perfectly. Internet Microphone and Sound are also working fine. Even Siri is Also Working. If you are YouTuber or want to explore macOS Just Install the MACOS Sierra. For you-tuber You will get Best Video Editing Software Which is Final Cut Pro. So, Just Install Windows in Another Disk and As UEFI Or legacy Mode. and You have Windows and macOS on a PC. If you want a video from my side to make a video on dual boot windows and macOS. Just Like this video and Comment down below. I will make another tutorial on this topic. So, Guys, we have Successfully installed macOS Sierra on PC Without any Use of Mac or MacBook. Simply comment down below, I will Answer as soon as possible. Like this video If this video Helped you. Comment down below Why you want to Install MacOS on You PC. Thanks for Watching and I will Catch you in the Next One.